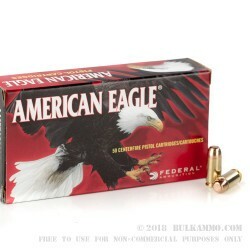 Another gem of a range round from the high-quality production lines of the Federal American Eagle production facilities. 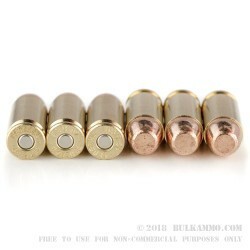 This is the 180 grain FMJ flat nosed variant of the .40 Smith & Wesson cartridge. It offers simple, reliable performance for a great price with a nice set of consistent components that are made in house mostly by Federal. This is a perfect practice ammo for just about any gun that can chamber it, as it has an even temperament that works well in so many firearms. From function testing to target practice the list of tasks this ammunition can perform well and at a steep discount to competitors, is long and getting longer. 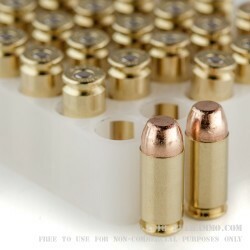 The same philosophy that governs the ammunition plants at Lake City that produce the superior quality military specification ammunition for the 5.56 rifles and 7.62x51mm rifles govern the production of this ammunition that can be found for a fraction of what most competitors price their premium range ammo at. With the Federal American Eagle ammunition, you are not only getting the legacy behind the brand that is Federal, you’re getting continual process improvement and some of the best quality control in the market.